When I first started working towards a more curated, ethically built wardrobe, my initial step was to purge my closet of everything that I didn’t wear on a regular basis. While the amount of clothing I had was never completely out of control, I did have quite a lot, and there were tons of pieces that I was never wearing! It felt so good to clean everything out. I was able to get my entire closet down to about 30 pieces (excluding shoes) for all four seasons of the year. For a while, I was really proud of that number. I loved the idea of a capsule wardrobe, and since we used to live on an extremely low budget, it worked out really well for our lifestyle. However, unsurprisingly, I started to feel pretty limited after about a year of having my wardrobe that small. We very much get all four seasons in Minnesota, so making that number of pieces stretch through all different weathers was definitely a challenge! By this time, I felt pretty comfortable in what my style was and which items I would reach for again and again, so I was confident in being able to build up my wardrobe again with pieces that I truly loved and would get plenty of wear out of. Practicality. My biggest clothing pet peeve is having sleeves or hems that get in the way, so making sure that tops can tuck easily is high on my priority list. I also stick to shirts that are either short-sleeved or have a sleeve that can roll up easily! I credit this to the fact that I’m always either a) writing and drawing at my desk, so fluffy or buttoned sleeves really get in the way or b) working at Botany, which calls for lots of dishwashing, hand-washing, and working with ingredients. I’ve learned over the past year or so that if I can’t easily keep the sleeves of a top out of the way, it gets almost no wear. I’ve learned that unique, flowy pieces like wrap tops don’t get worn as much, which is kind of sad! 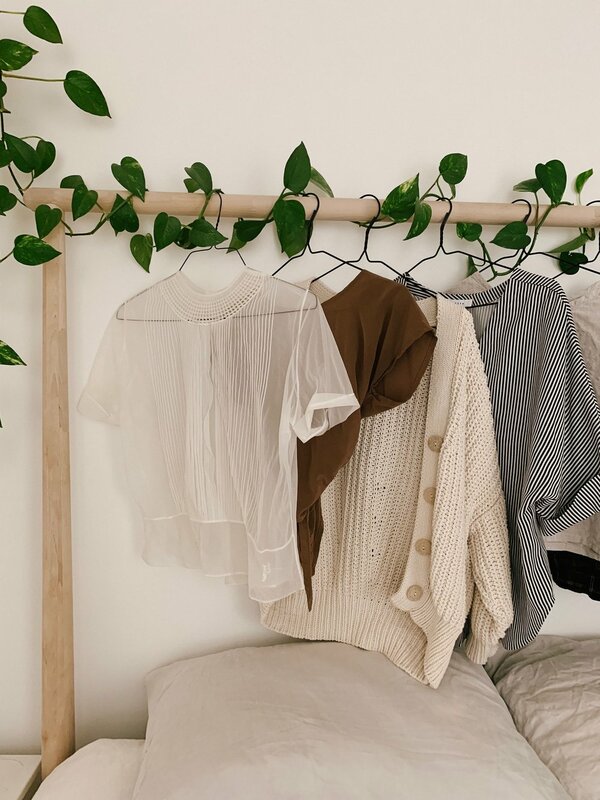 I love the way these tops look, but the bottom line is that I want something that’s really easy to throw on in the morning and will then stay in place throughout the day. I always find myself fussing with the neckline and the tie with wrap tops, and I’ll often take them off in the late afternoon and replace them with a tee or cozy sweater. I don’t wear jumpsuits often (also sad!) because I absolutely hate the hassle of using the restroom when wearing one! For pants, the ones that are easiest to slip into are the ones that get the most wear. If I have to shimmy too much or deal with lots of zippers or buttons, it just feels too complicated for me. A developed color palette. I love neutrals in every area of my life, and clothing is definitely included in that! 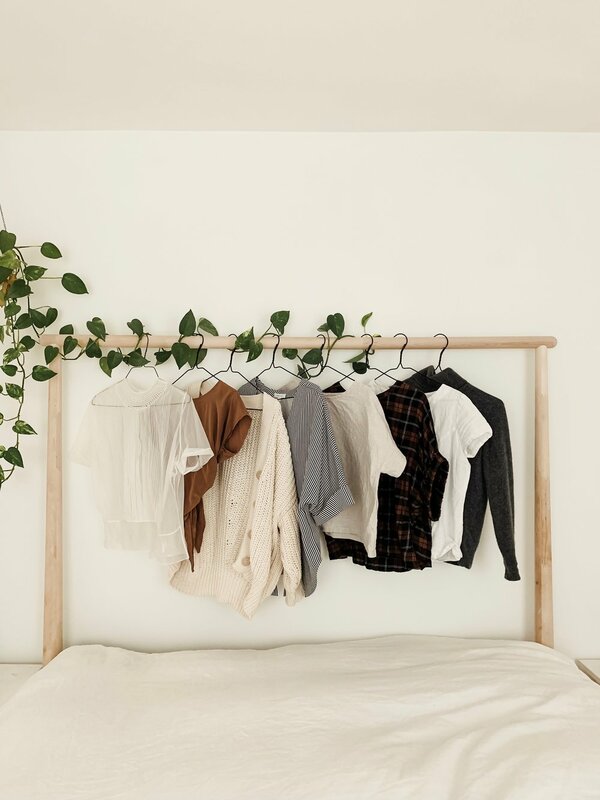 When one’s closet is small, it helps so much to make sure that pretty much all the pieces go together well so that you can mix and match multiple ways, resulting in the ability to build more outfits from fewer pieces. My base palette is black, white/cream, grey, camel/oatmeal, brown, and denim. I do add in a few colors here and there (mostly rust/copper, olive green, and navy) but even those stay on the neutral side because that’s just what I feel at home in! Comfort. This is always a major factor in making sure something gets worn a lot! We all feel good in different things, but for me it has a lot to do with fabric and cut. I’ve always felt most comfortable when I dress modestly, so I’ve learned that if something has a really low neckline or is too tight I probably won’t wear it. I much prefer tops that have a looser fit, and I love tucking them in with high-rise pants for definition. 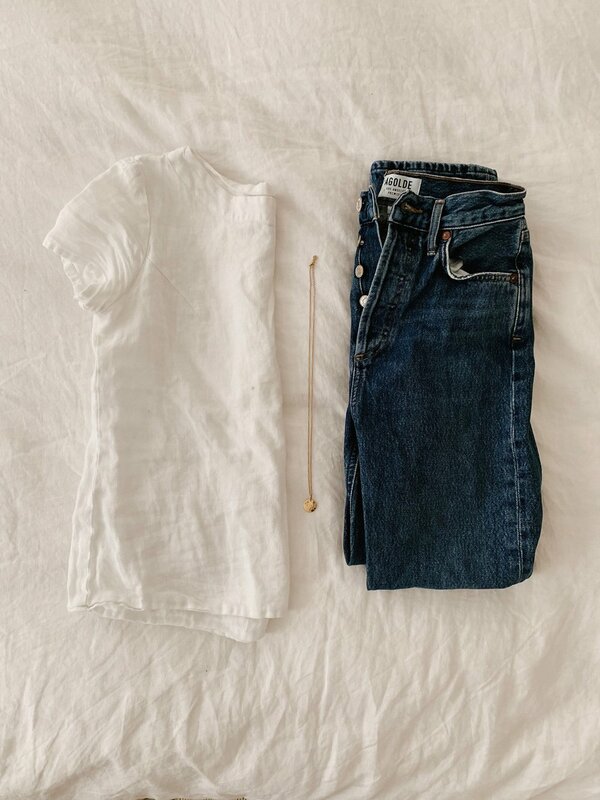 Linen is my favorite fabric to wear, and I also love tencel, silk, and denim. 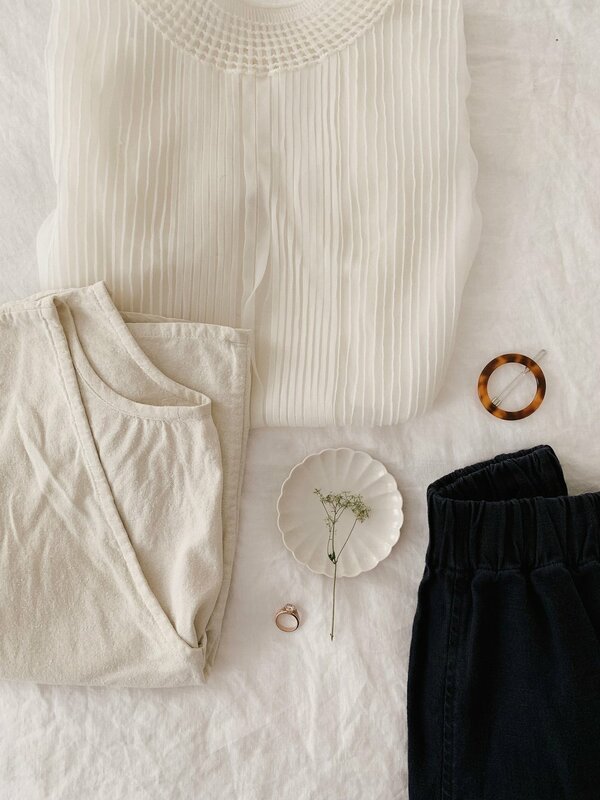 Classic style + versatility. 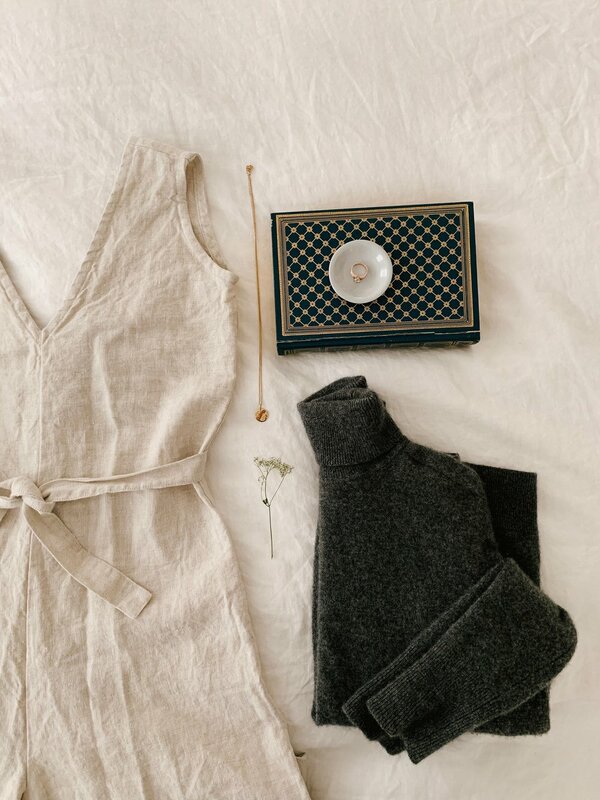 I want each piece in my wardrobe to last for years, so I try to stick to classic styles that I won’t tire of quickly or that I won’t desert at the end of a season. This results in a lot of my pieces being simple, but that works really well with my point about practicality! As I mentioned above, I like to be able to wear each different item with multiple other pieces in my closet, so versatility is also really important. I used to feel the pressure to really keep up with each trend that developed throughout the years, but I feel like I make purchases with much more thoughtfulness knowing that I’ll be keeping each item I buy around for a long time! Rise/Inseam. I only ever purchase high-waisted pants! I can’t remember the last time I bought mid-rise bottoms. I don’t like it when my back (or heaven forbid, my bum) sticks out while I bend over, and I also hate when my stomach shows when I raise up my arms to reach for something. I have a long torso and short legs, and so I prefer a really high rise (12+ inches). I love the leg-lengthening effect that high-waisted pants have! Anything that isn’t high-waisted would stay at the back of my closet 100% of the time. I also prefer cropped pants that hit right at the top of my ankle boots or show a little ankle with flats or heels! I’m petite at 5’3,” so a regular inseam is usually too long and the bottom hem requires rolling up. I don’t like the extra bulk that a roll adds to my silhouette, so cropped is the way to go! For skirts and dresses, I favor a midi length that won’t be too short when I bend or cause me to flash everyone if it gets too windy. I always go for a high rise in skirts, as well. The rule that I make the most exceptions to out of these is only buying practical items that I know I’ll wear really frequently! I love all of those pieces and they truly are what I reach for day in and day out. But sometimes, I just want something pretty or unique! I have three wrap tops, a couple of pieces with flowy or puffed sleeves, and a handful of jumpsuits because it’s so nice to mix things up a bit and wear a more interesting item sometimes. When I buy these pieces, I just have to make sure that I really, really love them in order to make them worth the money I spend. Decorative pieces also tend to be the most expensive, so I have to think really carefully before committing! I usually think about these for weeks to months before finally making the purchase. I prefer the majority of items in my closet to be ones that I’ll wear many times over, but in my mind, the truly special ones that don’t get worn as often do pull their weight, as well. They may not get worn as frequently, but as long as they stick around for a long time, it’s totally worth it to have a handful of pieces that only get pulled out for special occasions! I’m doing a wear count for the month of April in order to learn even more about which pieces I choose over and over again! I don’t expect this exercise to completely revolutionize the way I see my closet, but I’m excited to see which pieces I wear the most and which ones take more of a backseat! Those are some criteria that work really well for me and curating my closet! If you have any tried and true methods for choosing clothes that work year after year, I would love to hear about them!